We are sharing the Complete list of Upcoming Bollywood Movies in 2015. We have many announcements of films which are going to release in 2015 but all dates are not confirmed by Producers. These dates may change as per the schedule and the updates related to the Movie. 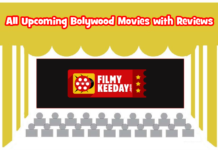 So Keep in Touch with our Official Twitter Handle @FilmyKeeday or Like us on Facebook. Note : These are not the confirmed Date of the release of these movies, Release date of Bollywood films in 2015 may change. You can keep in touch with us for any confirmation.